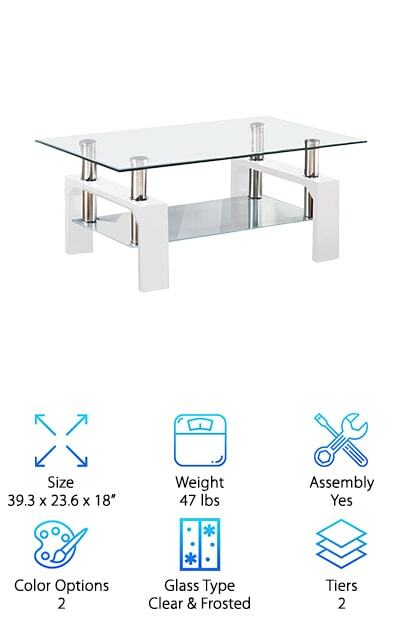 Ready to spruce up your living space with a sleek, contemporary glass coffee table? Modern wood and glass coffee tables can bring a spacious, classy vibe into any room. In fact, so many stylish options are available, choosing can be tricky. No worries. We’ve researched a variety of new and bestselling products to bring you ten of the best modern glass coffee tables out there. Before we jump into the reviews, here are some features to watch for when shopping. 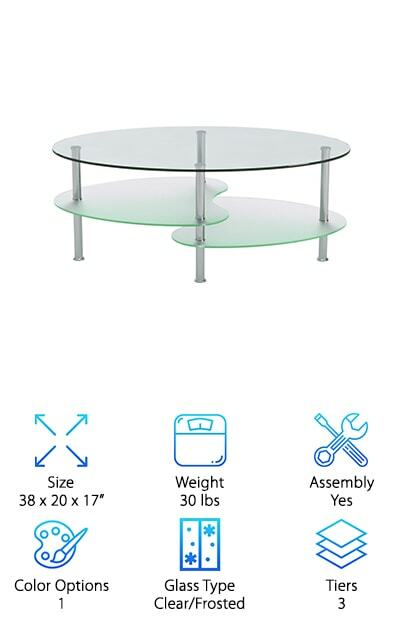 Size: Are you planning to tuck your modern glass table into a library nook or show it off in the middle of the den? Specific dimensions will help you decide which tables to rule out before you fall in love. Weight: A coffee table’s weight can give you a better idea of its aptness for your purposes. Will it ever need to be conveniently moved? Will it be sturdy enough to hold up under a stack of leather-bound first editions? Assembly Available: You may prefer to have an expert assemble one of the more complicated modern coffee tables for sale. In the following reviews, we’ll let you know whether or not assembly is available for the coffee table you favor. Color Options: Some of the following contemporary coffee tables are made entirely of glass. Others may have wood, metal or painted parts with various color options. Gather with a glance the color options offered to match your existing décor. Glass Type: Choices, choices. 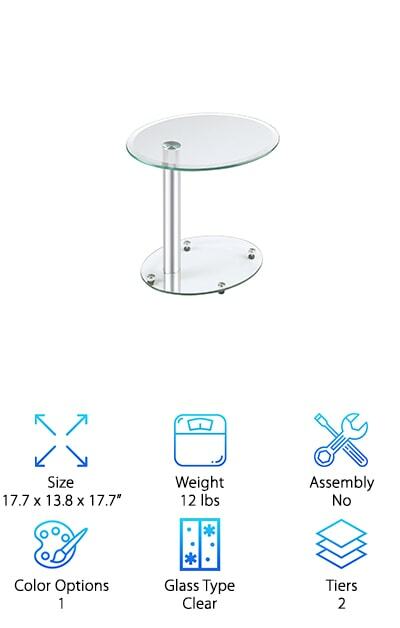 You can choose an elegant coffee table with crystal clear glass. Or you can go with the equally sophisticated frosted glass. We have even reviewed one option below that offers both the ice and the smoke. Tiers: Some of the unusual coffee tables we reviewed include another feature we love: a second tier. This lower shelf can be used to display decorative items. It’s also perfect for keeping books or magazines safe from drips or spills. Now you know exactly what you’re looking for in a modern glass coffee table. But you might be wondering: Where do I start? If you’re in a hurry, take a look at our top pick and budget pick. If their stylish simplicity doesn’t satisfy, we have eight other lustrous suggestions. Looking for a bright, modern touch, a chic accent, or a sophisticated statement piece? One of these affordable and cool coffee tables may be a perfect fit. Check it out! Our top pick is the extremely simple and elegant Tangkula Glass Coffee Table. This small modern coffee table made a big impression on us. Fashioned out of a single, U-shaped slab of glass, it’s a lovely piece that needs no assembly or accessories. This table can be unobtrusive and fits neatly into smaller rooms. What’s even better is that it gives the impression of space and luxury, visually enlarging a tight area. 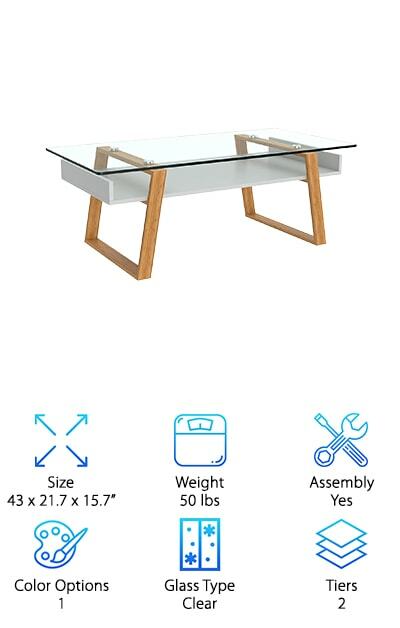 Made out of thick, tempered glass, the Tangkula Coffee Table is super sturdy. It’s a long-lasting purchase that will hold up handsomely even with heavy use. Worried about smudges on all that glass? Don’t be. The glass does not seem to smudge easily and is incredibly easy to clean. Bottom line: this graceful table brings luxury coffee tables to another level with its smooth, modern beauty and svelte design. And it does so while being a completely functional, affordable, easy to care for piece of furniture. Pretty amazing. 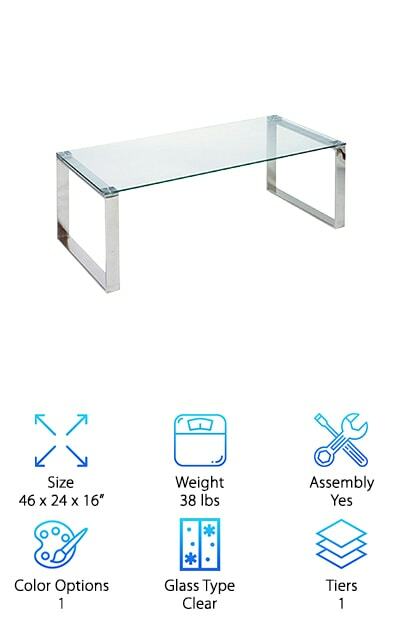 The VIRREA Rectangular Glass Coffee Table is an inexpensive option that will still looks like a piece of modern art. Its two tiers are made of durable, scratch-free safety glass. The top tier is clear glass, while the bottom shelf is frosted, a classy variation. Texture is introduced with the bright chrome-like metal bars and glossy legs. And check this out. You get three color options—black, white or walnut—so this little table will look terrific in any room. This table has an intricate appearance, but assembly is a breeze. Instructions are provided, along with all of the fittings needed. And even though it looks like a modern centerpiece, the VIRREA table is very practical. The convenient bottom tier is perfect for storing books, magazines or remote controls, leaving the top tier open. How can it get any better? This versatile piece is a great option that will add a chic ambiance to your space without breaking the budget. For a modern coffee table with timeless appeal, it doesn’t get much better than the bonVIVO Designer Coffee Table. This elegant piece fits perfectly with an urban, minimalist style or a warm country look. In fact, its design is simple and masterful enough to complement almost any home décor. Fashioned out of solid glass and wood, with bamboo legs, this attractive piece of furniture gets a lot of attention. Are you ready to hear the best part? Not only is it lovely and affordable, the bonVIVO Coffee Table is practical to the extreme. It’s deep, solid wood shelf is perfect for tucking away all of the magazines, remote controls, and other trappings that would otherwise clutter the clear glass top. It is easy to clean and care for, and appears to hold up well even with hard-wearing daily use. Here’s the deal: For versatile visual appeal, robust quality and ultimate functionality, it doesn’t get much better than this tasteful table. Looking to add a little extra sparkle to your living area? We’ll give you the scoop. Among the tables reviewed, the Monarch Coffee Table stands out as a large modern coffee table with a dazzling array of options when it comes to color. Two solid pieces of clear tempered glass form the base of this table, while the top comes in a variety of glossy shades, including the uniquely patterned “grey cement.” This chic showpiece has a polished look that will brighten the room and contribute a fresh, exclusive ambiance. You may be wondering, with all its gloss, if this table is practical for daily use. Yes! The Monarch Coffee Table offers a lot of wide-open surface area, making it great for the games, coloring pages and drinks of a high-activity home. And here’s the kicker: Although it has an expensive look, this table is a very affordable option. All that stateliness and style doesn’t have to break the budget. The Ryan Rove Fenton Oval Table breaks the mold of glass coffee tables with its innovative design. Three offset, oval tiers give this smaller table a light, airy look that will translate to the room in which it is placed. Its delicate build is highlighted by the sparkle of clear glass and polished steel legs. 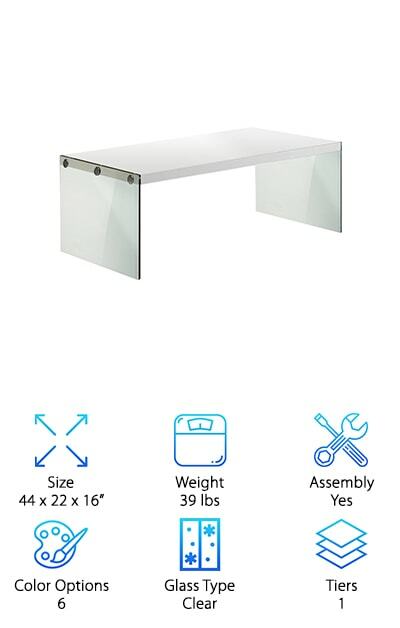 You can play with the design of this table by choosing either the all clear glass option, or one of the two frosted glass options. One variation is a solid, frosted glass oval tier on the bottom with the two smaller, clear glass tiers on top. Or you can choose to have the two frosted smaller tiers topped by a solid, clear glass oval. Think about it: These twinkling glass tiers tucked into that empty space may be just what your living area needs to lighten its mood and add scope. The graceful curves and depth of this lovely little table seem to spell serenity. The curvaceous design of this adorable glass coffee table is one we don’t think you’ll ever get tired of looking at. This is a beautiful choice as an end table or cocktail table. The round glass table top is accented by a black edge. Even more exciting are the gleaming nickel-finished legs. They appear to twist and turn in all directions, giving you the idea of a piece of modern art. 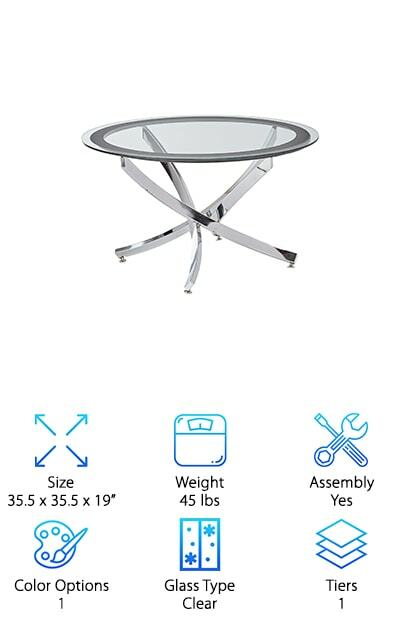 You may fall first for its simplicity and affordability, but the extra pizzazz offered by the unique and brilliant leg design is what makes this neat table a lifetime piece. If you’re a DIY kind of person, you’ll be happy to know that this table comes with picture instructions and is not too hard to assemble on your own. Expert assembly is also available. Ready to settle on a clean, classic end table with a contemporary twist? Here it is. The Coaster Coffee Table is a solid, stylish choice. What’s more modern or stunning than simple glass and chrome? 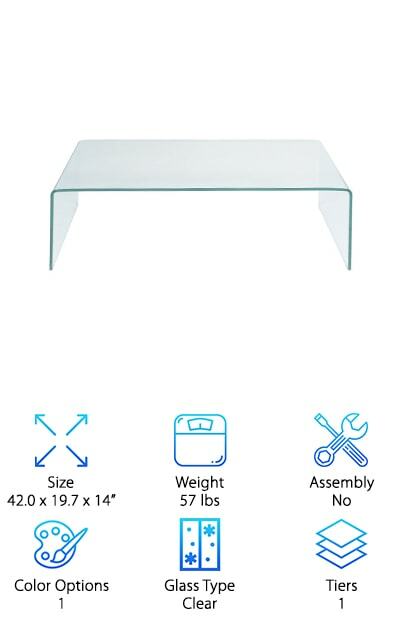 Get back to the basics with the Topeakmart Glass Top Table. 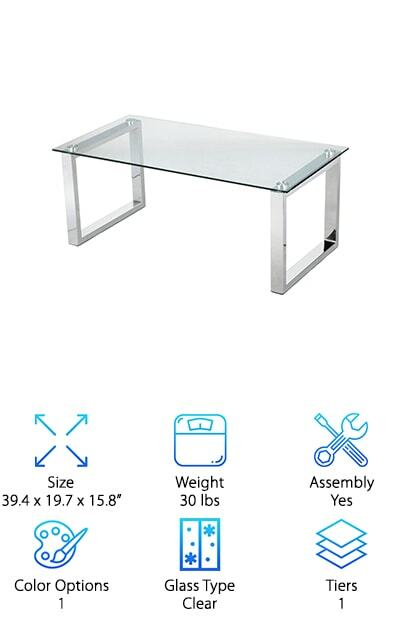 This solid table combines a smooth, tempered glass top with impressive iron braces finished in a bright chrome. This large glass coffee table holds to a timeless rectangular shape that is also strong and looks fabulous. Its minimalist accoutrements that will fit well with any contemporary interior design. Set-up is simple, and everything you need is included in the box, but assembly assistance is also available if needed. The table’s stable design is very functional and easy to clean. Its wide-open space makes it very versatile, with plenty of space for games, books or refreshments, depending on your needs. So here’s the deal: If you’re looking for ageless quality, modern suavity, and unfailing practicality the Topeakmart table is a fabulous choice that’s unlikely to disappoint. Let this glass and chrome beauty be the “wow” factor of your modern decor. You know that table where you end up putting just about everything? Books, clocks, unfinished projects. It needs to be strong enough to hold a lot of weight, yet tiny enough to tuck into that convenient corner beside the bed, or the armchair or the door. If it looks great too? Well, that’s a huge plus. The RFIVER 2-Tier Coffee Table is just this type of table. It’s two clear glass tiers can hold up to 22 lbs and 88 lbs respectively, and yet it’s small enough to stay completely out of the way—and even to look cute in a very cool way. 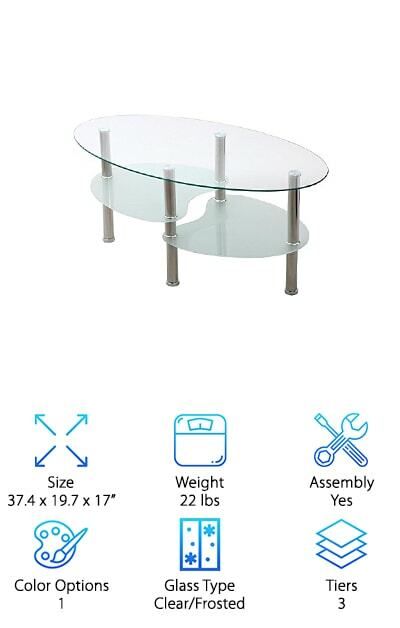 The glass tiers are fastened to silver metal tubes, and assembling the table yourself should be no big deal. One more great feature makes it a no-brainer for us: adjustable feet so you can make sure it’s sitting level even on uneven or carpeted floor. This lovely little table is perfect for small offices or apartments where you want to save space without giving up glamour. This beautiful and affordable table is sure to get compliments as the centerpiece of your living room or office. Its graceful curves and layers are distinctive and serene. They are also safer than tables with sharp corners if you have small children, clumsy pets, or are just prone to barking your own shins now and then. An elegant oval of clear glass forms the top tier, which is uniquely set off by two lower tiers of uniquely shaped frosted glass. The three offset levels give you plenty of space for a potted plant or two, a cup of hot tea, and your current read, making this table as practical as it is pretty. Brilliant stainless steel legs lend extra contemporary elegance and flair. Assembling the table on your own is also fairly simple. Just do as your partner tells you and read the included instructions. Then kick back and enjoy the extra panache this sophisticated piece brings to your home. The Cortesi Contemporary Coffee Table boasts an incredibly sleek, modern design and plenty of smooth, functional space. The top is made of thick, clear tempered glass that can hold quite a bit of weight without causing any concern. The chrome-finished legs are sturdy stainless steel. To top it off, this high-quality table has a fantastic minimalist look. The glass and chrome design is simple and brilliant. Unlike traditional wood coffee tables, this glass-topped version visually opens up the space it inhabits, giving your area a spacious, airy aura. This makes it an excellent choice for smaller rooms or apartments where you need a large table but want to avoid a crowded feel. A great mix of durable, distinctive, practical and easy on the eyes, this dependable piece of furniture will enhance any room in which it is placed. If you dig an ultra-contemporary style, this stunning table is an easy, affordable option you will definitely want to check out.